A couple of notes about today’s employment release. As with nearly all measures, the unemployment rate is not perfect. The biggest issue with it is that the unemployment rate can go up for good reasons and go down for bad reasons. Today’s job report is an example of the former. The labor force is growing, as more people are looking for work. 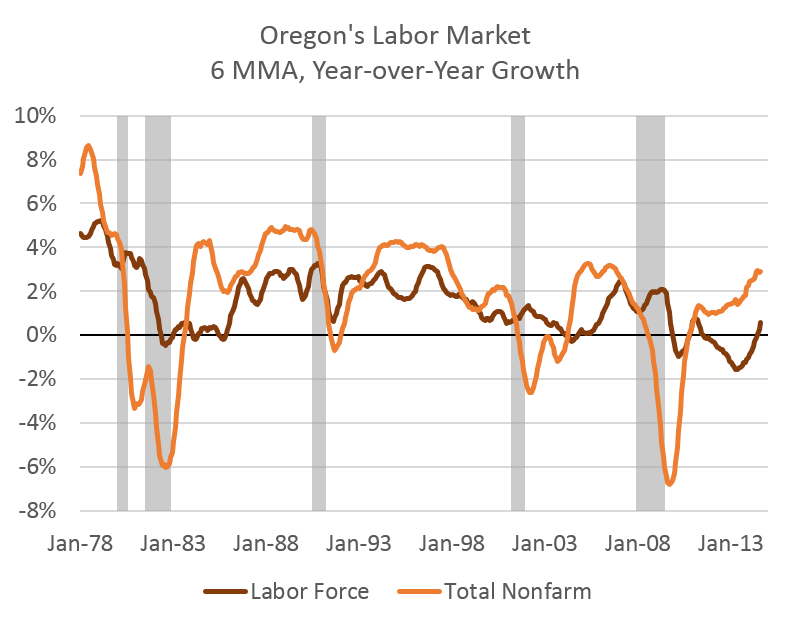 This is good news as it signals that more people are moving to Oregon and/or more Oregonians are being drawn back into the workforce as job opportunities increase. However, such changes do keep the unemployment rate high, even if the the underlying economy is improving. These dynamics, including the labor force response, are something our office has been discussing quite a bit this year. Economic data is noisy. Particularly real time monthly estimates. While less interesting, the real story is usually in the revisions, particularly now that our friends at the Employment Department are doing quarterly benchmarking as well. For example, the June employment estimate was initially said to be -4,300 jobs. This was revised to -3,000 the following month when July was initially estimated to be a gain of just 200 jobs. This was revised today to show a gain of 1,300. Each month was a swing of more than 1,000. Both happen to be swings in the positive direction, however you can find negative swings in recent years as well. So, focusing purely on that initial employment change can be problematic, some times very problematic. However, we still use it as an indicator of the underlying economy. Our office uses the benchmarked employment data as the backbone of a lot of our models, but the most recent monthly data is used more as an indicator. Not unlike a lot of the other leading and coincident indicators available, either from our office of the University of Oregon. As we write in each of our forecast documents, our offices uses four main sources for jobs data: payroll employment, household survey, monthly withholding tax receipts and the quarterly census of employment and wages. Generally, all tell a similar story however when one does not, it helps to place it in the broader context of the other indicators available. The greatest benefit of the CES (monthly establishment survey) is its timeliness, however it can be subject to substantial revisions. In fact, if you go back and look at the past 2 years of benchmarked data, the 95% confidence interval around that initial monthly employment change is +/- 7,000 jobs. 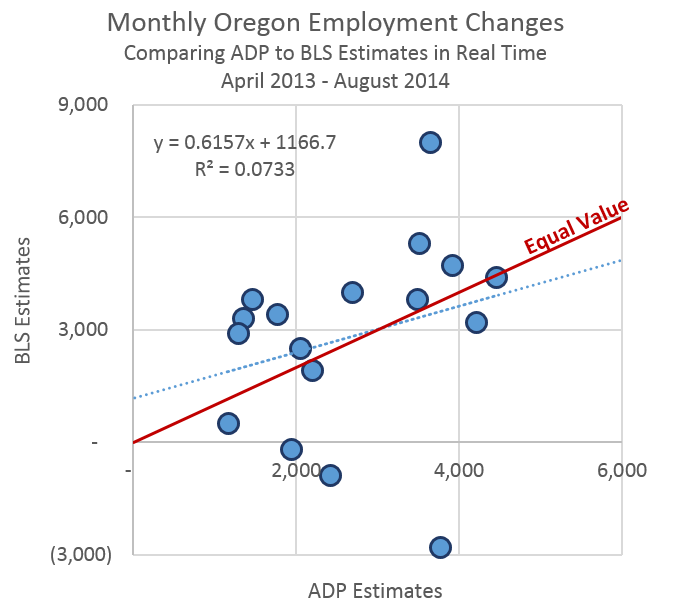 That means in August, Oregon’s employment changed somewhere between a gain of 10,000 or a loss of 4,000. Or to put it differently, there was about a 1 in 6 chance that Oregon actually lost jobs in August instead of the reported 2,900 gain. Again, that does not mean one should ignore the monthly estimates, but do take them with a grain of salt. Combining them with the other available measures helps place the trajectory of the economy in perspective. With that being said, however, one monthly estimate that you can freely ignore is the state level ADP report. As seen below, since ADP began releasing state level employment estimates on a monthly basis in April 2013, their ability to predict what the official BLS estimates will be is pretty minimal.